The developers of Camera+, the most popular alternative to Apple's Camera.app on the iPhone, have posted updated statistics regarding the performances of Camera+ in the App Store, and the results are quite astonishing. 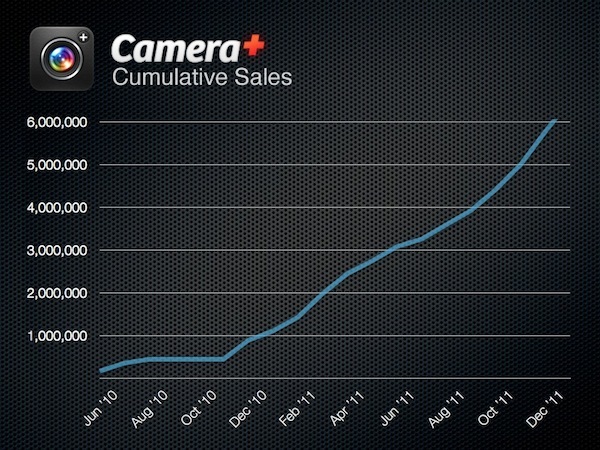 To date, Camera+ has sold over 6 million copies and earned over $5 million after Apple's cut. Camera+ was first released on June 7, 2010, and was later pulled from the App Store in late July, only to come back in December 2o10 with version 2.0. Since then, the app has been growing in popularity and receiving updates with various enhancements and bug fixes. The two most relevant things contributing to the large jumps on the right side of the above chart were the launch of the iPhone 4S in early October and the annual Christmas bump. Both were increases that were expected but what’s been surprising is how long each has lasted. tap tap tap's latest blog post is interesting not just because of app sales numbers alone: I think it provides good insight into the 4S "bump" from October and the typical sales increase in the holiday season, which is related to new users buying apps for their new devices. This year, however, sees a new iPhone model released against the holiday season for the first time. It's been widely reported the iPhone 4S should be selling really well (we'll know more on January 24), but tap tap tap's numbers seems to suggest an impressive growth, not just a good one. Camera+ is a rare example of a paid app maintaining a stable growth over time with only a few promotions and features by Apple. Read more about the app's sales figures here.